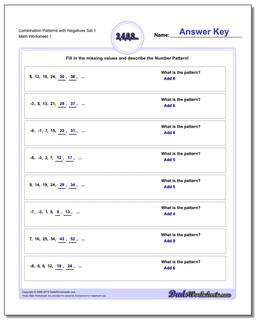 This page contains links to free math worksheets for Patterns with Negatives problems. 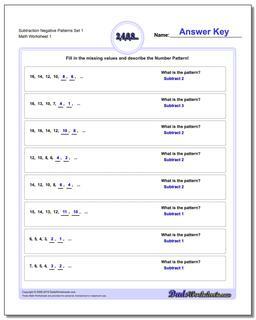 Click one of the buttons below to see all of the worksheets in each set. You can also use the 'Worksheets' menu on the side of this page to find worksheets on other math topics. Subtraction patterns leading to negative numbers, patterns starting with negative numbers and multi-step patterns that may cross zero. Multi-step number patterns that may cross zero. Number patterns provide great practice for learning multiples or recognizing logical relationships between numbers in a sequence. The prior sets of worksheets dealt with positive numbers, and were a great introduction to simple patterns that could be expressed easily as increasing integers. Once students have been introduced to negative numbers, number patterns that move across zero and into the realm of negative numbers are a great way to reinforce these concepts. In many ways, these patterns can be related easily to number line problems involving negative numbers. 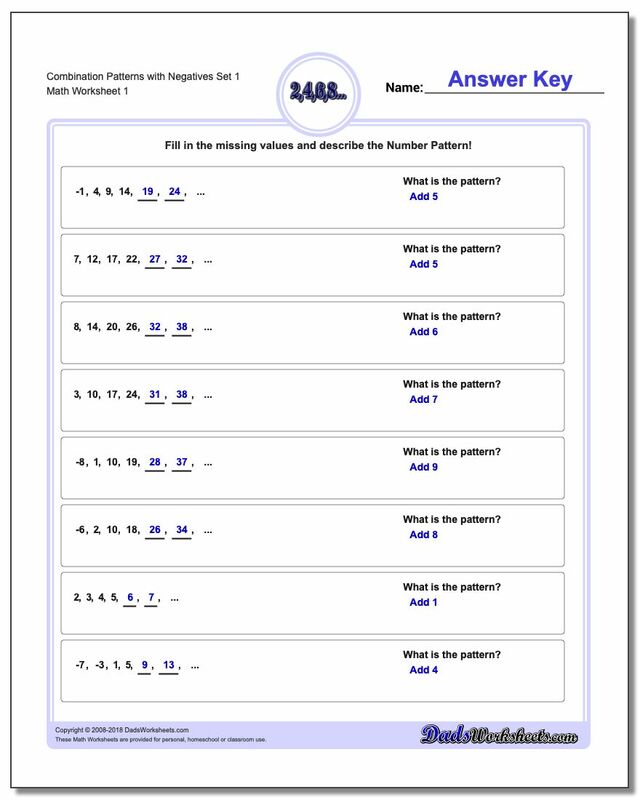 Practice with these worksheets will reinforce negative number concepts and also prepare students for standardized tests that incorporate number patterns as a key math skill.